The West Coast rapper isn't considered among the best by Billboard. Tupac has been left out of Billboard’s Greatest Rappers Of All Time list. The ranking, which has sparked controversy in the Hip Hop world, includes familiar names such as Jay Z, Eminem and Notorious B.I.G. but has omitted Drake, Kanye West, and more. “This is so disrespectful! !," said Snoop Dogg. There's been many people on Twitter that share Tupac's sentiment, tweeting their shock at not seeing Tupac's name on the list. No Tupac on the Billboard list?? I'm done!!! How is Tupac not in the @billboard top 10 rappers of all time? tupac wasnt on the Billboard's top ten rappers of all time???????????????? Fans on our Instagram page also voiced their disappointment that Pac was left off the list, some claiming that Lil Wayne did not deserve a place. Billboard have moved to justify their exclusion of Drake and Kanye West, claiming that they were ranking rappers on the list as MCs and not artists. 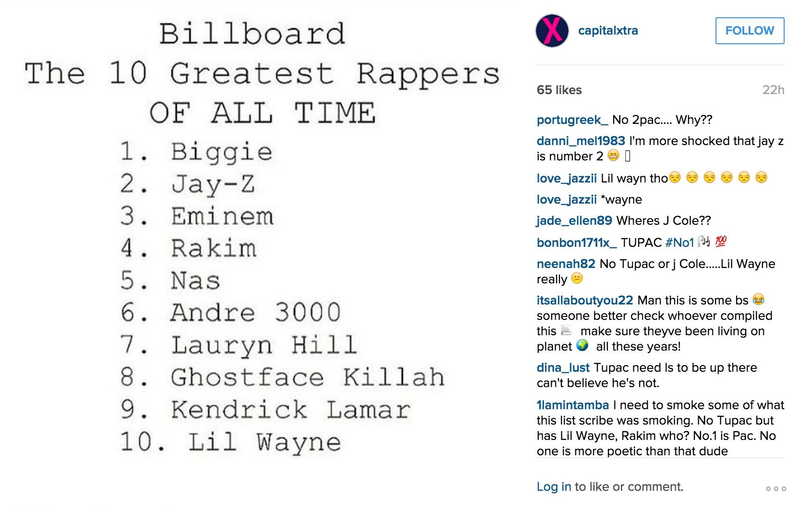 However surprisingly there has been no explanation of Tupac’s absence from the list. Follow Capital XTRA on Instagram.